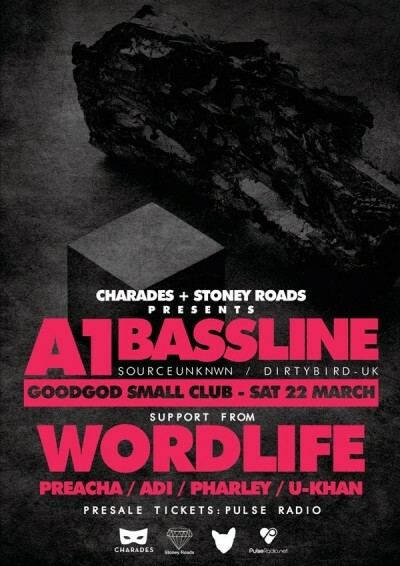 Sydney bros Charades and Stoney Roads have teamed for the very first time to present the forward thinking House and Techno of UK heavyweight A1 Bassline. A1 Bassline will be bringing his unique brand of hard hitting basement vibes to the Goodgod Danceteria on Saturday the 22nd of March. After developing his distinct sound A1 Bassline has continued to constantly evolve and stay ahead of the game, comfortably earning his place on the famous Dirtybird label family tree. If that’s not enough for you, the boys have enlisted an all-star lineup of Sydney locals featuring Wordlife, Preacha, U-Khan & Adi to hold down the early and late night proceedings. Strap up we’re going in!